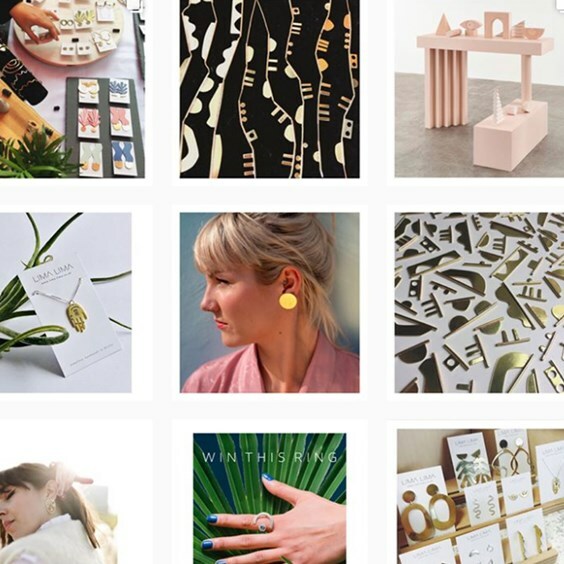 Whether you want to improve your Instagram game or looking to set up an account for your handmade jewellery business, you’ve come to the right place! We want to share with you our top tips on using Instagram to sell your handmade jewellery designs with success. What is Instagram? It's a social networking app used to share photos and videos to your profile feed (a grid of images). It could be that your business is already on Facebook and you’re thinking, why do I need to be on another social media site? Instagram is one of the most amazing platforms to get exposure. Instagram is a visual app which means it's perfect for promoting your handmade jewellery and a great way to get noticed. Your ultimate goal is to gain sales but in order to get these sales, you need to grow an engaged following, be interactive and gain exposure. Instagram is a brilliant platform to do just this! It couldn’t be easier to find potential customers seeking particular pieces of jewellery and handmade gifts. In this post, we've featured some of our favourite jewellery Instagram accounts of our talented customers! The main image is of This Story Jewellery, we absolutely love the pink and purple pastel theme showcasing stunning designs, along with dreamy imagery to inspire you. Firstly, you need to create a personal account and then connect it to a Facebook business profile through your settings. By creating a business account you can choose which category you fall under, create adverts, see insights and tag products. When you set up your account, you'll be asked to create a username. If you have a business name already, it's great to use this as your username handle. This way, you can keep consistency online with your other platforms which makes it easier for people to find you. If your name is already taken, don’t worry too much - you can add a word such as design, jewellery, studio to make it work. Instagram will tell you whether a name is taken or not, so keep trying until you find one which suits you and your brand. Now it’s time to create an engaging bio - this piece of text tells people more about you on your profile. It’s up to you what you’d like to share about your business, but some ideas include describing what kind of jewellery you make and your location. Don’t be afraid to use emojis too! It’s a great way to add some fun and personality to your account. Your profile picture will appear on your profile and alongside your posts and comments in people’s feeds. Here you can use your logo or perhaps a photo of yourself if your brand is focused on the person behind the jewellery. The choice is yours but take into consideration your overall branding and how it will fit. Many people connect more with seeing a person behind the account, so maybe if you use your logo as your profile picture, you can post photos of yourself on your feed instead. Your brand is how you represent your business and how your customers perceive it. It can be easy to post whatever photos you have to your Instagram but it’s time to think on brand! Follow your brand guidelines and ensure that what you post will fit in with your branding and that your descriptions match your tone of voice. When browsing other people’s feeds, you will notice many have their own theme. Whether that’s choosing a particular colour scheme, posting quotes every other photo or using the same filter each time. Decide how you want your feed to look and keep it consistent, for example you might want to have a feed that is bright and colourful - so ensure each photo matches this. Unfortunately, a phone snap of your jewellery may not cut the mustard. To stand out on Instagram, you’ll need high quality, bright, crisp and clear photos of your handmade jewellery. This is the best way to show off your jewellery to potential customers and makes it more desirable to potential buyers. If you have more than one image of a similar item or event, you can use the multiple image icon to select more than one image and upload them into one post. This way you won't have to worry about cluttering your feed with the same content. It’s completely up to you what you write alongside your uploads. It could be short and sweet, or a couple of paragraphs long. Your description needs to be interesting and offer your followers a chance to engage with you. Don’t be afraid to use emojis too! This adds personality and fun to a post and will make people more likely to comment underneath. 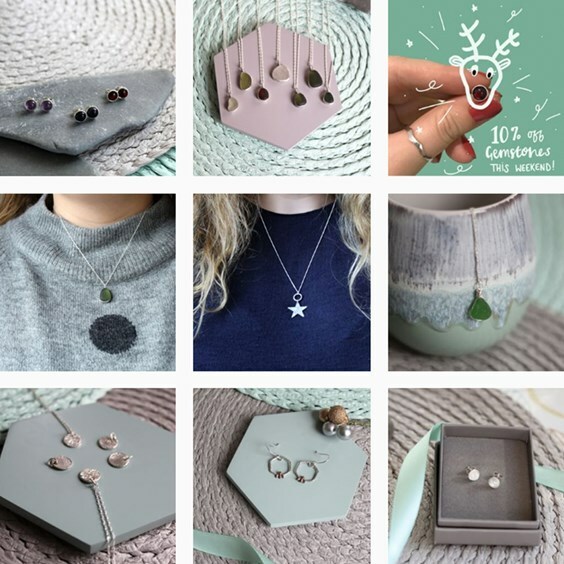 We love Jordan Lily Design's Instagram feed, featuring her brand colour of mint green throughout her feed - when you visit her page, you instantly know it's Jordan's beautiful jewellery. We also love the illustrations which add personality to her feed. Minimal, simple and stunning. 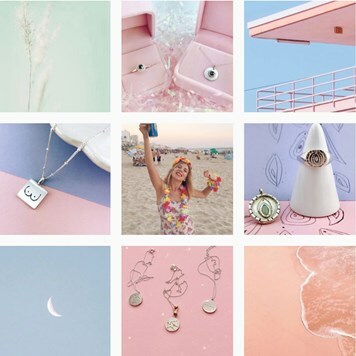 Minimo Jewellery's fresh feed is a joy to scroll through, with a mixture of content from seasonal images, workshop photos to finished pieces. By clicking on the search icon, you will find new content and accounts generated through similar posts you're already interested in. This is a great way to find new jewellery makers to connect with and follow, as well as customers who may be interested in your jewellery. Who knew that being social on social media was the path to success! But really, it’s so important that you like and comment on other people’s posts. This way, you are getting your account out there and making it more visible to others who may want to check out your account. Don’t be social for the sake of it though, comment on posts that you love and tell that person why you love it! It’s all about starting a conversation and building great online friendships. To get others to engage with your posts, ask questions to your followers to get the conversation started. The quicker the interaction with your posts, the more likely people will see it in their feed. 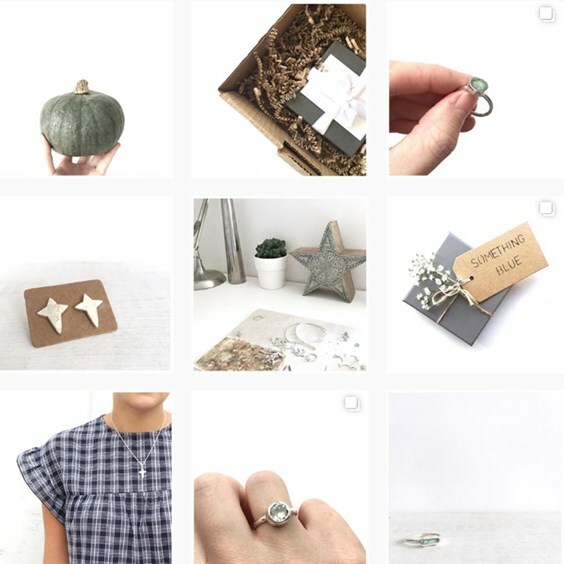 Instagram doesn’t have to just feature photos of your jewellery, it can be a place to show off behind the scenes snaps such as your deliveries, gemstone stash and your top tips. People love an insight into your creative processes and you’re more likely to gain engagement on these posts if you show off your personality. People also love to see time-lapse videos of something being made, so experiment with video and create content which you’d like to see yourself. Maybe you’re exhibiting at a craft fair soon? Instagram is a great place to promote future events or chat about them once they’re finished. Share the event on your page and over on Stories too, tag people also attending and use hashtags so people can find your account. What’s amazing about Instagram is that you can see your customers wearing your jewellery and talking about it! Encourage customers to follow you and tag you in their photos wearing the designs. This will increase your followers, build brand awareness and allows you to build a great and loyal relationship with your customers. Once they have posted, ask them whether it would be ok to repost onto your Instagram page - by doing this, you are giving them exposure but also showing potential customers how loved your jewellery is. It’s a win, win! Make sure you respond to every comment or message you receive. People love when you take the time to reply to their comment or question. Reply with another question and keep the conversation going if you can. Instagram Stories is a feature accessed through the camera icon where you can post photos and videos which disappear in 24 hours. If you haven’t used Instagram Stories yet, you’re missing out on potential sales and engagement. This is your chance to relax and enjoy creating content which you don’t have to worry about so much as it will be gone the next day! With Instagram Stories it’s all about experimenting with its fun elements such as using gifs, text, mentions, polls, geo-tags and hashtags. Not only is it fun to use, these hashtags and location tags can help your account be found. If you swipe up on your Story, you will see who has watched your story and find analytics too such as how many people you reached. If you’re feeling brave, a great way to interact with your followers is by speaking to the camera - scary huh? It really works to capture people’s attention and allows your followers to get to know the person behind your business. Tell your followers about your day, tell them about your studio, share your failures! Anything goes. If you want to save your Instagram Stories from disappearing, you can save them to your Highlights where you can have separate collections. Whether this is your current sale items, behind the scenes clips or customer posts. Rhi from Lima Lima Jewellery uses stunning imagery of her botanical inspired jewellery throughout her feed. Incorporating a mixture of models, lifestyle shots and behind the scenes action. We also love watching Rhi chat to the camera about her latest makes over on her Stories. Teän's Silver Shed gives us all those coastal vibes! Her branding really shines through her Instagram feed, with her brand colour of turquoise being the basis of her feed. Teän's shares simple yet beautiful shots of her finished jewellery, as well as posting text images of promotions, giveaways and upcoming events. Ahh, hashtags. These are fantastic keywords which other people are searching for and if you use the right ones, this will give you the chance to be found by new audiences. Use hashtags in your description but always make sure they are related to the content you are posting. Popular hashtags for jewellers include - #jewellerymaking #jewellerydesign #jewellerylover #jewellerydesigner #jewelleryoftheday - you can also use creative hashtags such as #handmade #handmakers #makersgonnamake #handmadewithlove #handmadejewellery. If you're posting a piece of jewellery which has turquoise in for example, use related hashtags such as #turquoise #turquoisering #turquoisejewellery. Don’t copy and paste the same hashtags into each post as Instagram can stop your post appearing in people’s feeds. So always tailor your hashtags to fit each image. Search hashtags to find jewellers and creatives to connect with and don’t forget to engage with these posts if you like them. You can also follow hashtags and those using the hashtag will pop up in your feed, giving you even more inspiration during your daily scroll through Instagram. At Kernowcraft we always use the hashtag #Kernowcraft as this is a great way to get customers to share their designs using our supplies. This is also wonderful for other jewellers who would like to see other jewellers who love to shop with us too. Adding your own hashtag creates a little community in the wide world of Instagram and builds trust and engagement among your followers. Instagram is a great place to share offers and any promotions you’re running on your website. Get people excited and don’t forget to mention it on your Stories too. Want to grow your followers? A giveaway is a great way to build your followers and get your brand out there. Choose what piece of jewellery you’d like to giveaway and decide what the entrant needs to do to enter - such as liking the post and following your account. Don’t forget to include any terms and conditions too. It can be hard to grow a following and get your brand out there with such a saturated market. There are plenty of ways you can promote your jewellery including getting in touch with influencers (people with a large following). Many of these influencers are bloggers who have their own website and often do sponsored campaigns or reviews for other businesses. As a small handmade business, you can get in touch with an influencer asking whether they’d be interested in being gifted some jewellery in the hope they will feature it on their page or even write a blog on it. Send them a direct message over social media or find their email address which is usually linked on their website or Instagram bio. This is a great way to connect with other creatives and can really boost your page. It’s not all about the number of followers you have, what you need to focus on is your engagement. Once you've mastered this, the followers will come in time. With an Instagram business account you can boost posts to reach more people or target it to a particular audience. You choose the budget and timeframe, then Instagram does the rest. A good example of using the boost feature is when you’re running a giveaway, putting some budget behind this will allow new people to be introduced to your business. Instagram has launched a product feature within Instagram. As long as you have uploaded your products to your Facebook catalogue - you will be able to tag your products when uploading your image to Instagram. Followers can then go straight to the product and purchase easily. Don’t forget about analytics! You can access Instagram Insights through the menu (three horizontal lines) on your profile. Using this is a great way to find out more about your followers such as their location and age. You can also see what content works best to engage your followers and use this to plan future posts. Although other jewellers on Instagram could be seen as competitors, each one of you offer something different. Use this platform to form relationships with other jewellers, show your support by following and chatting to them. The great thing is that you can be part of a community of jewellers and help each other along the way. Your followers want to see regular content from you and if they don’t, you may lose them as a follower. Make sure you’re posting frequently to make the most out of the platform. Don’t be shy and keep posting on Instagram Stories as much as you can! If you're already on Instagram, you may have noticed 'link in bio' being stated quite a lot in post descriptions. This means that whatever that person is talking about, they have posted a link in their profile for more information. Unfortunately, you cannot post a link in an actual post but you can push people towards your bio link. This is a great place to put a link to your website or Etsy page too. Another option is to use platforms such as Link Tree which gives you the chance to feature numerous links if you're likely to promote more than one thing. The save function on Instagram is a brilliant tool if you want to see the post again. Each post has a flag and when you tap it you will be able to save it to your own private collections which you can find on your - here you can keep designs, photos and ideas to look back on and find inspiration. We adore Sophie Cunliffe Jewellery's personable approach on her Instagram feed, where her lovely personality shines through. 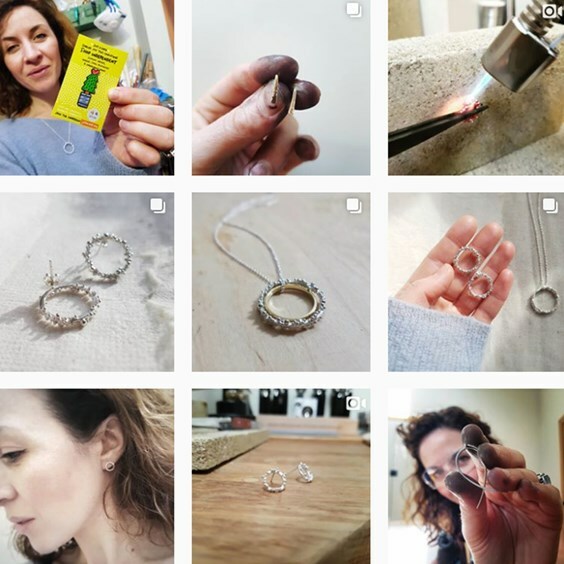 We see a mixture of pretty jewellery designs, workshop selfies to home life and it's a joy to follow along with her jewellery. 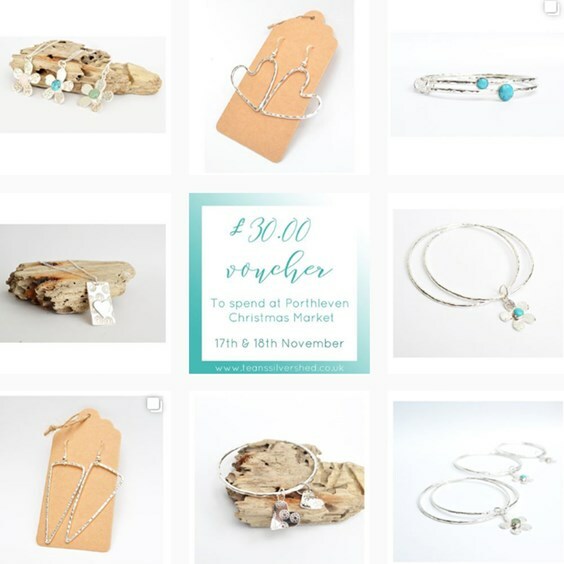 Cornish jeweller, Sadie Jewellery makes us want to run to the beach with her Instagram feed. 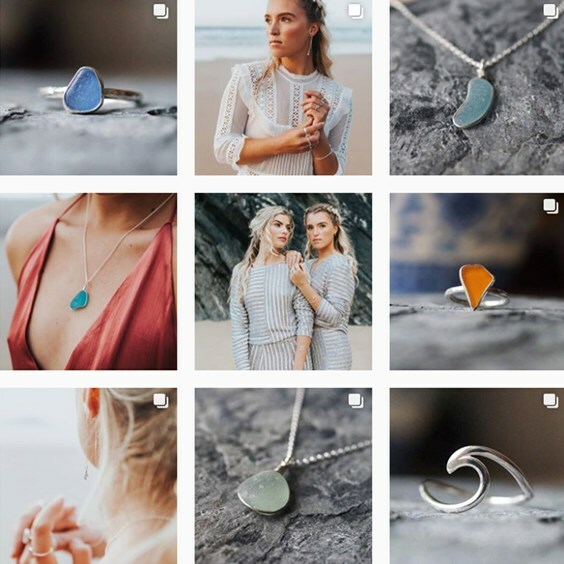 Sharing snaps of her sea glass jewellery, collaborating with models and lots of behind the scenes fun! Sometimes there’s just not enough hours in the day, so it can seem hard to remember to post every single day. Fear not - there are plenty of social media scheduling platforms available to help you organise and do the work for you. 'Later' is one tool which is widely used, where you can actually schedule posts and see a preview of what your feed looks like. It would be very unusual to become an Instagram sensation overnight! Success won’t appear straight away but with time and patience, you will find that you will grow a loyal and engaged following of potential customers. Don’t be worried if your followers aren’t growing, keep making conversations with other creatives and customers, while also focusing on good quality content. Before you know it, you'll be wondering why you didn't concentrate on Instagram sooner. Don't forget to follow suppliers such as Kernowcraft to stay up to date with new gemstones and products to use in your designs. We love sharing customer's work and supporting them by sharing their designs. Your goal is to create sales, and by being shared by other pages you are more likely to gain followers and be seen by potential customers! Tag @Kernowcraft and use #kernowcraft for a chance to be featured!